By what metric do they measure that I wonder? Did it really mean "the author's most popular language" perhaps? It's true I get as many different results as google hits for "most popular programming language" but I'd have said this was fairly representative. It's true Python seems to be "on the up" but not sure if it's hit the top in 2018? By what metric do they measure that I wonder? I suspect they're also making the all-too-common mistake of saying "popular" when they mean "widespread". So it wasn't me that said it - I was just quoting Adafruit. If I create one Github with 1,000,000 LOC written in C++ then 500 repos of Python with 1,000 LOC which of those is "more popular" ? 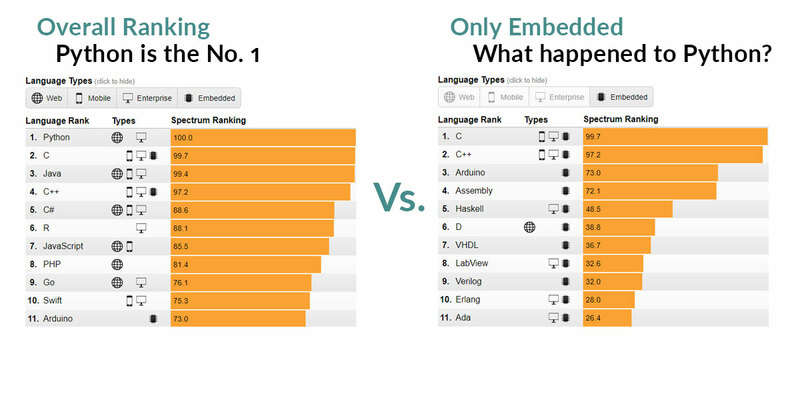 In total there are twice as many lines of C++ as Python but 200 times as many repos for Python than C++. Python has become the (sic) most popular language. You mean, "the most popular (sic) language amongst projects that are published on GitHub"
Those results are based on events including people getting stuff from GitHub - it has no way of knowing how many people are getting Python stuff from GitHub and thinking, "Oh **** - it's in Python". Statistics are fine so long as you know the methodology. For this reason whenever possible I link to the sources when posting a possibly controversial statistic. I thought that "Arduino" IS C++? Isn't Arduino "just" an IDE? Yup, I wouldn't classify "Arduino" as a programming language. Statistics are fine so long as you know the methodology. Very true - as Cliff illustrates very well in #4. I could add that my brother is a statistician - and he gets very annoyed at people bending statistics to inappropriate and invalid conclusions! +1, +2, +3, .... I couldn't agree more! A lot of people talk about the "Arduino language" when what they really mean are (4), (5) and maybe (6) above combined. Of course a lot of people call Arudino "a language" because they simply don't recognise C++ when they see it! It's because it is so many thing that there is so much confusion when people say things like "yeah but I want to move away from Arduino". What they probably mean is that they want to retain the PCB and the bootloading/avrdude but then stuff it full of something else that does not involve (3) .. (6). Why do you think I chose that particular example ... ?! I guess "ecosystem" would be the buzzword here ? Only (3) - I think? What does? Only (3) - I think? But just because it runs on Mac is not necessarily what makes it "Arduino". There are other AVR dev systems that work on Apple's oddball PCs too. So I don't agree with it as (7) anyway. I thought the whole Arduino thing worked on Mac ? My point was that I can develop on a Mac without ever touching Windows so I'm very grateful for the Arduino platform. It'd be amazing if the recently released Vidor 400 with the FPGA has a way to do Verilog synthesis+place&route on the Mac too - something I've been waiting for for over a decade! My point is that's purely down to the Arduino IDE - it has nothing to do with any of the rest of the Arduino "platform" or "ecosystem". edit: We all know how easy it is to accidentally/purposely break C portability and bind it to a specific platform. Fortunately avrdude, avr-gcc and binutils were designed to be portable, so the authors of these tools also deserve much credit for the existence of Arduino. But I think that all comes under Cliff's (3) ? Only (3) [the IDE] - I think? Well, there's also the choice of "host interface", and compiler, and so on. It wouldn't have been uncommon for Arduino to join the ranks of "well, I guess you could theoretically build the tools for MacOS, but we haven't done that, and the driver for the USB thing we did only works on Windows..." Getting (at least) CLI compilers for MacOS and Linux is a lot easier than it used to be, in general. I'm not sure whether that's a result of customer demand, or just embarrassment that "an IDE put together by a bunch of art majors can do it!" I've always considered myself relatively OS-agnostic. "If a tool only works on Windows, I'll use a Windows system" (or some hack. Back in the EAGLE 3 days I had set up EAGLE on linux, accessed via X-windows on the Mac.) But my "main system" has been a Mac for a long time, and the whole plug&play nature of Arduino was a surprisingly big factor in my getting back into microcontroller programming. Of course a lot of people call Arudino "a language"